In a wonderfully revealing tQ interview back in 2015, Jaki Liebezeit – the revolutionary and boundlessly influential German drummer who passed today from sudden pneumonia aged 78 – said of the early days of Can and the experimental German music scene of the late 1960s and early 1970s: "We were trying to find our own way. We thought like artists. Imagine a painter saying I can't suddenly paint like Andy Warhol or like Jackson Pollock, so I have to find something else, something original. It takes a while, but it is possible to find." With a potent cultural maelstrom of avant-garde music, art, architecture and design swirling around the Kunstakademie, the Robert Schumann Conservatory, and Joseph Beuys' Creamcheese Club in Düsseldorf at the time of Can’s formation in 1968, Liebezeit and his band were indeed artists who instantly adopted a strategy that was entirely new insofar as rock music was concerned. Reconfiguring psychedelia as an improvisational art-form that melded jazz, minimalism and African rhthms by way of open-ended jams which they dubbed “instant compositions,” Can’s nigh on telepathic spontaneity – perfected on their extraordinary triptych with vocalist Damo Suzuki, Tago Mago, Ege Bamyasi and Future Days – saw Liebezeit and his groundbreaking modus operandi operating at the very beating heart of the emerging Krautrock scene. A rare innovator that saw the unlimited possibilities that rewarded a little altered thinking, Liebezeit – who first began his musical career as a trumpeter and later as Germany’s leading jazz drummer, playing with the likes of Chet Baker – helped pioneer the style of Motorik polyrhythms that came to define the genre. Where Can’s textures and compositional freedom blended Cage's spontaneous music and Schoenberg's dissonant explorations, Liebezeit’s craft – which he regularly said was influenced, above else, by machines – took repetition, accuracy and unusual rhythms to fashion stark, thrashing, hypnotic grooves that simultaneously married an open-ended jazz mindset with distinctly metronomic precision. With Klaus Dinger of Neu! spearheading the 4/4 Motorik strut best, Liebezeit took the concept of glorious repetition much further by commanding forward-moving, unravelling polyrhythms that were not merely intrinsic to the very concept of losing oneself on the dancefloor but also hugely influential on the more electronically-inclined Kosmische peaks of the likes of Kraftwerk, Cluster and Tangerine Dream throughout the 1970s. While Can's Holger Czukay once said Liebezeit was "more inhuman than a drum machine” the drummer himself said it best when he told an interviewer back in 2014, “I can play a little bit like a machine but the difference between a machine and me is that I can listen, I can hear and I can react to the other musicians, which a machine cannot do.” By simultaneously marrying rhythmic precision with percussive vision, his ultra-disciplined, hypnotic approach has influenced generation after generation of musicians as mottled as various techno pioneers and punk bands, as well as the likes of Sonic Youth, Stereolab, The Fall, Beak> and countless others besides. Having said, “I don’t use loops; I play loops. I always tried to make my own loop and repeat that pattern with subtle variations,” Liebezeit’s ability to second-guess his bandmates and command a concert became something that – along with their fiercely improvisational approach in the studio – set Can apart from many of their peers onstage. Having compared it to “re-creating a movie on a theatre stage”, their live show doubled up as one-off exhibitions where three-minute pieces could become 15 minutes on the night. 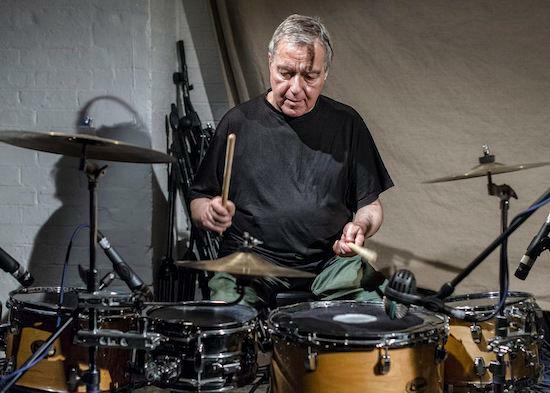 With his robotic, pulsating beats – complemented with jazzy fills, and a distinctive complexity few drummers could ever match – Liebezeit’s masterfully controlled presence, ability and reliability reverberated right through the live scene and far beyond. Having worked with acts as diverse as Brian Eno, Neu! 's Michael Rother, Depeche Mode and Jah Wobble over the decades, Liebezeit was set to join Irmin Schmidt, original Can vocalist Malcolm Mooney and Thurston Moore for The Can Project (“an orchestral reinterpretation of classic Can material alongside new work with the London Symphony Orchestra, before an all-star band of former Can members and long-time admirers pay tribute to their pioneering music”) at the Barbican in April. Whilst the show may no longer go ahead, there can be no doubt whatsoever that the unprecedented demand for tickets stems directly from a source defined by Liebezeit’s own towering artistic legacy. As he himself said in the highly re-watchable BBC Four documentary Krautrock: The Rebirth of Germany: "We did not try to play rock & roll because it's not the thing we're born with. We have to find our own way." And how.